National Night Out, established in 1984, is held annually across the country with law enforcement organizing their own events in their respective communities. 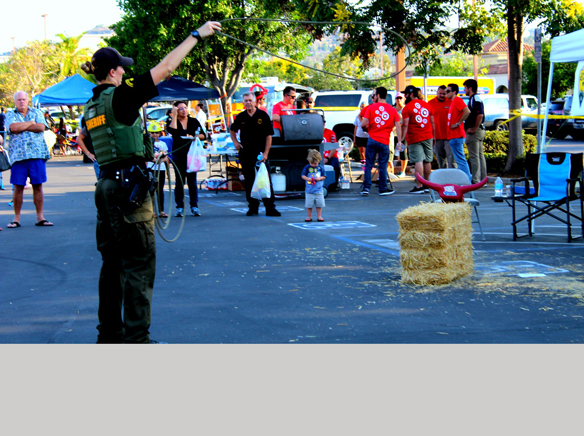 Locally the County of San Diego’s Sheriff’s Department hosted events in many communities they serve such as the city of Santee. “Everybody deserves to have somebody find them,” said John Buzzard a member of the County of San Diego Sheriff’s Search and Rescue team at the 2016 National Night Out event held at Santee Plaza Shopping Center on Aug. 2. What John Buzzard voiced was one of the messages heard at the Santee National Night Out 2016. National Association of Town Watch is a sponsor of National Night out and the phrase town watch is apropos for the event. “We come to make a statement that the criminals are not in charge,” said Assistant Sheriff Mike Barnett. Other organizations and businesses attended the event including the U.S. Border Patrol, Santee Fire Department, Home Base Ranch with safety information for attendees. For the young, clowns were on hand, games and Santee’s Target store supplied free hot dogs and hamburgers. Home Base Ranch supplied a couple of bales of hay with a set of cattle horns on top to have attendees and deputies practice lassoing or old school sheriff skills. “We get asked about smoke alarms, CPR, and any number of questions,” said Capt. Kyle Moyneur with the Santee Fire Department which also supplied a fire truck for the kids to learn about the business of fighting fires. Sheriff’s deputies showed up in a variety of uniforms appropriate to their rank and unit. Horses used in parades and as mounts were also on hand. Parked sheriff’s patrol cars, -SUVs and trucks offered the opportunity for the young attendees to see up close what deputies use to patrol local streets and freeways. All badges had black bands across them to honor fallen San Diego Police officer Jonathan De Guzman who was fatally shot July 28.